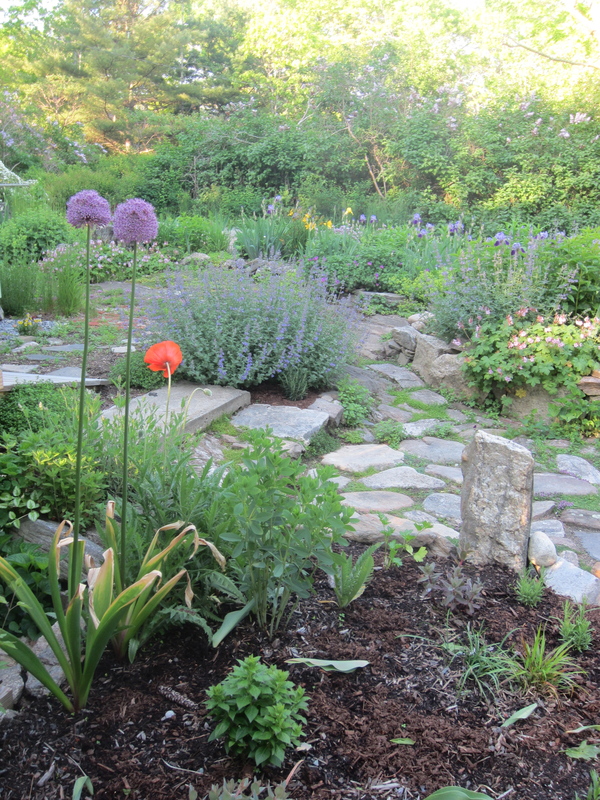 After a very long, wet mud season, spring finally arrived in Georgetown in late May. Our (mostly Kate’s) hard work in the garden last year has really paid off. 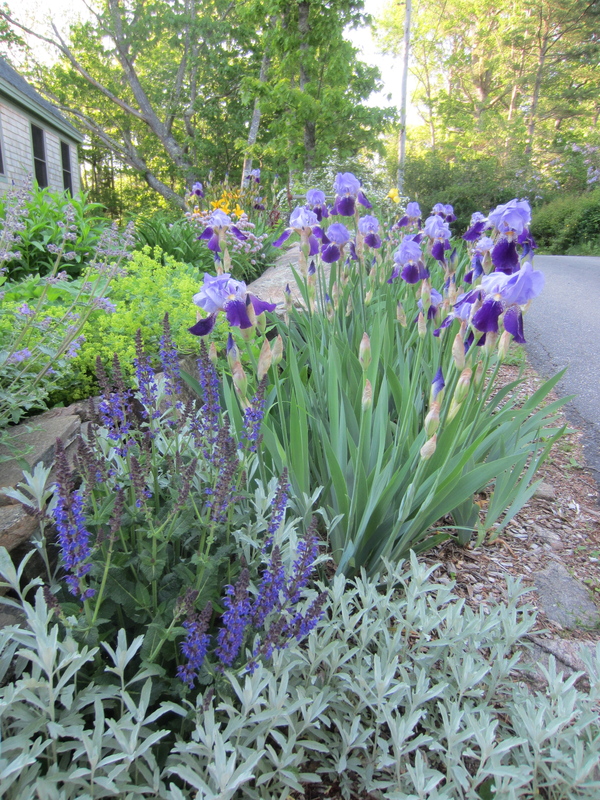 The irises that Kate salvaged and re-planted are in full bloom, and they’re a real showstopper! 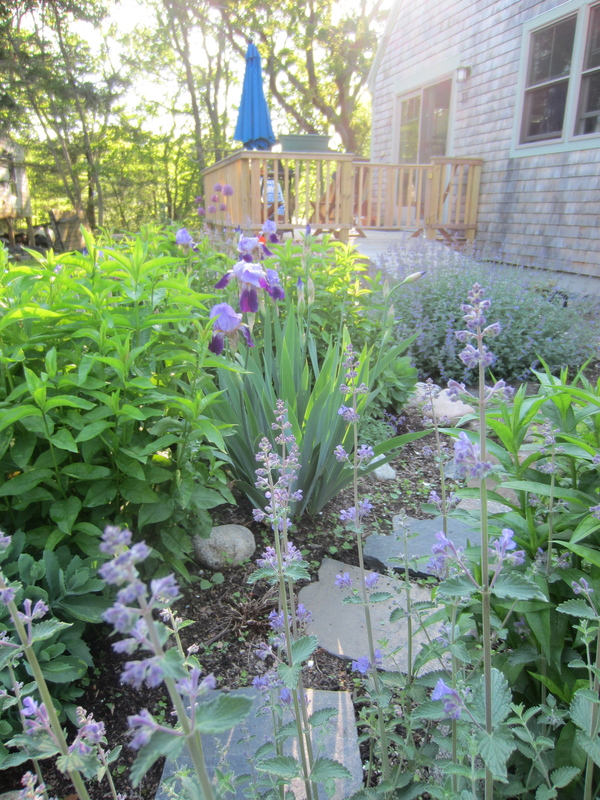 I also love all the catmint and the alium at the end of the new deck. 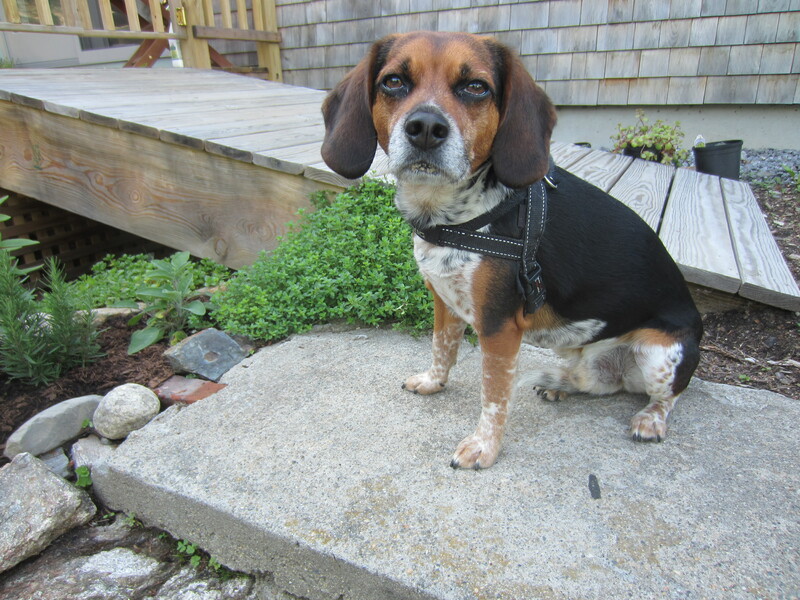 And, of course, Boogie is still fulfilling his role as garden overseer. Robert is guest blogging again. Sunday, February 24. Yes, it’s snowing again, for the third weekend in a row. It is February in Maine, after all. No worries. We are well stocked and ready to ride out the storm. I wanted to share a little pink gold with you. As I previously mentioned, Maine shrimp season started in late January, and I was determined not to miss the boat. First up were the trawlers, in which a fishing net is used behind a boat to capture the shrimp. 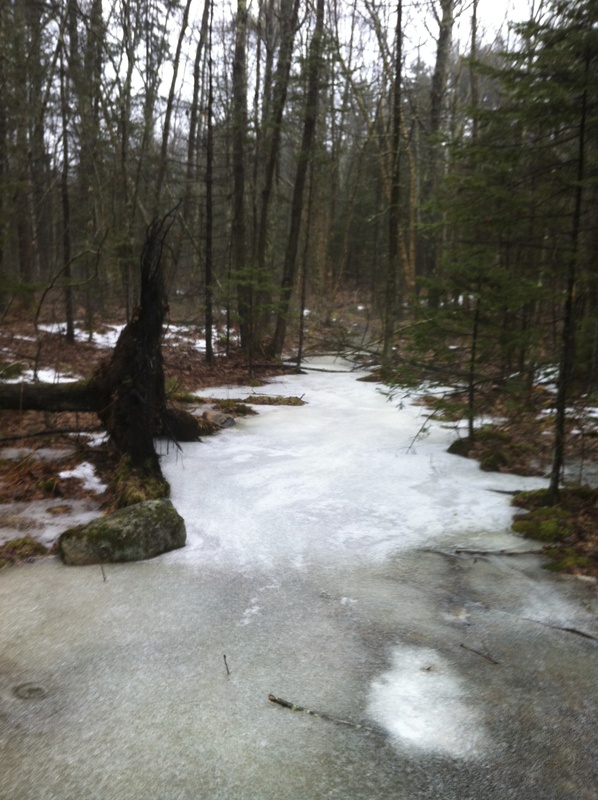 A few weeks later, the trappers’ season opened. Here, the little devils are caught in traps (similar in appearance to lobster traps, but with much smaller holes, obviously). Locals tell us the trapped version are of a higher quality than trawled shrimp. At this point, I can’t really tell the difference. 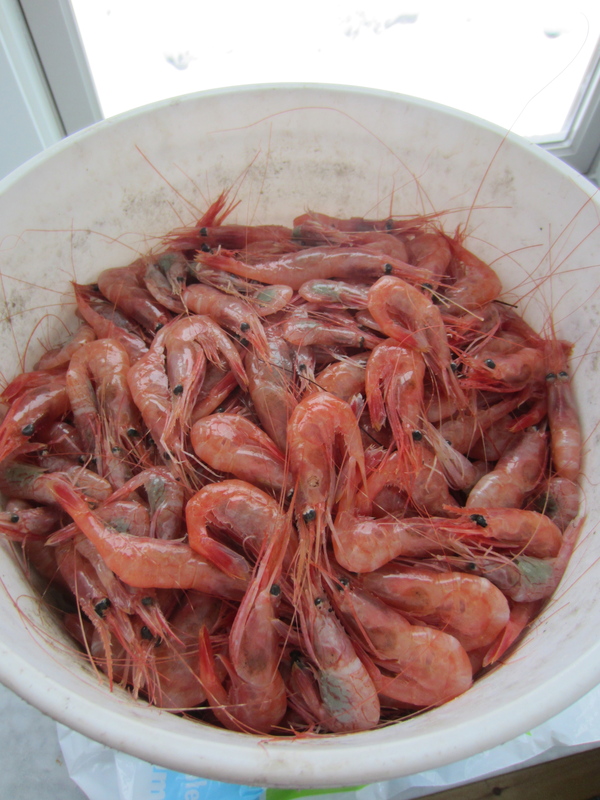 At the end of the day, I bought 10 pounds of trawled shrimp from a fish market in Bath when the trawl season started. Then I bought the mother-load, 28 pounds, of trapped shrimp from one of our neighbors during the weekend of the blizzard a couple of weeks ago. Over the last few weeks I had to do a lot of cleaning and freezing to make sure this pink gold will last us for awhile. While I haven’t used a lot to date (although I see a shrimp dip on the agenda for later this afternoon), we did have good luck with a couple Maine shrimp dinners earlier in the month. The first one was a Thai Tom Kha Gai soup. (Sorry, no pictures of this dish.) There are plenty of recipes on line for this soup, most with chicken. I subbed out chicken for shrimp. We were able to find the other obscure (in Maine at least) ingredients at a terrific new Asian market in Portland, Veranda Asian Market. A key ingredient in the soup is galangal, a member of the ginger family. Also important are lemon grass and kaffir lime leaves. As I usually do with soups, I used a fair amount of homemade stock (made from the shrimp shells). The flavorful stock allowed me to cut back the amount of coconut milk in the recipe. I do love coconut milk, but man, that stuff is full of fat!! This soup is a winner, and when combined with jasmine rice, it’s a wonderful winter meal. 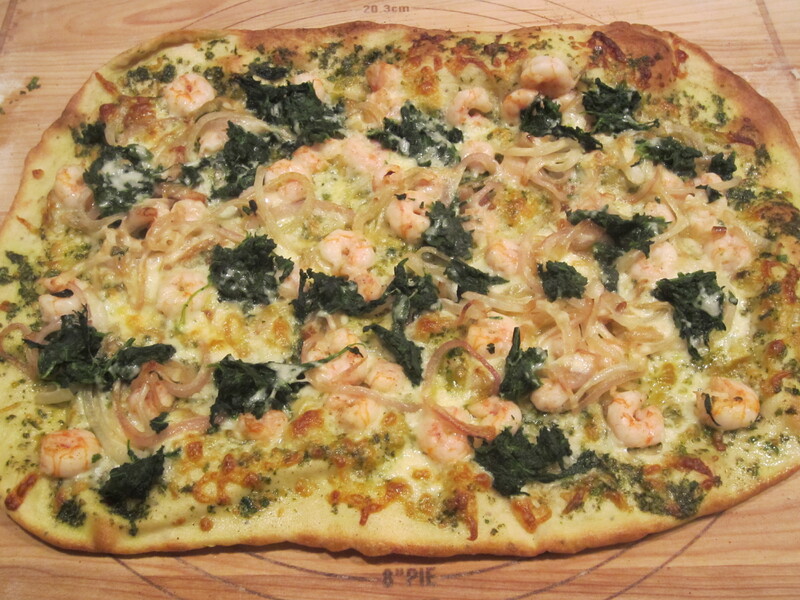 The other dish in which Maine shrimp were the heroes (as my man Ming Tsai would say) was a white pizza. I made a nice herbed oil sauce (with basil, parsley, garlic, red pepper flakes, and olive oil), and then added mozzarella cheese, sautéed shrimps, spinach, and onions. (See the before shot directly above, and the after at the top of the post.) We like our pizzas nice and thin so they stay crisp on the bottom. 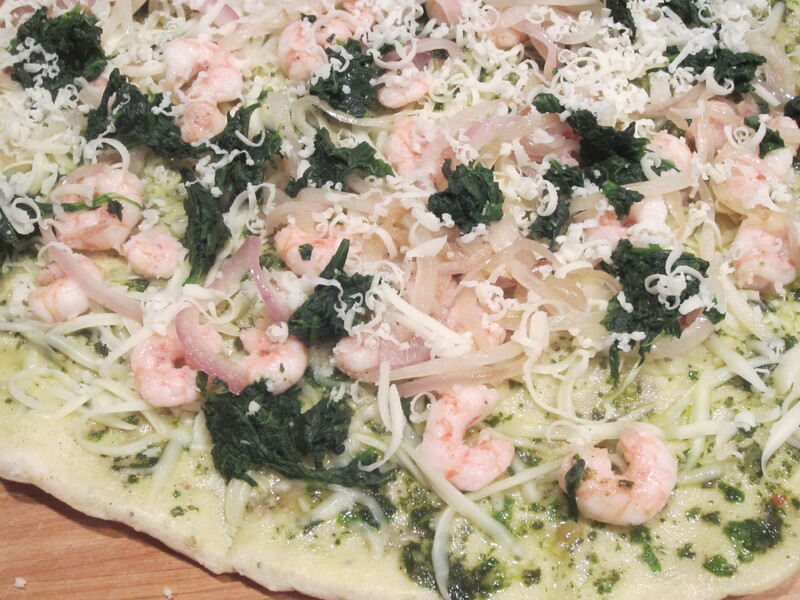 I think white shrimp pizza is my all-time fave, and with 30-plus pounds of shrimp in our chest freezer, I see this recipe on my weekly list for a few months to come. The neighborhood is abuzz (literally) with snow blowers and plows clearing paths out to the rest of the world. 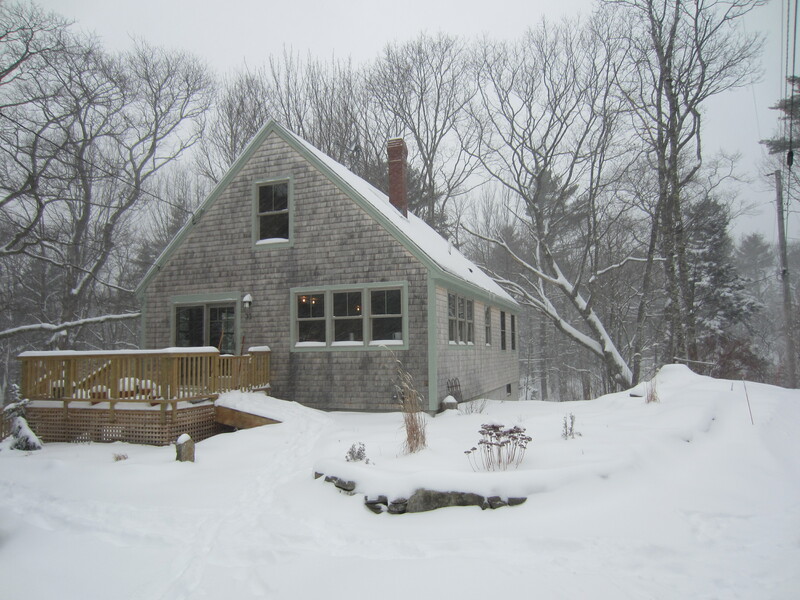 What is it about a big snow event that makes us so eager to get OUT? Luckily, the sun was shining bright today, and the temperatures rose to a balmy 30-something degrees. 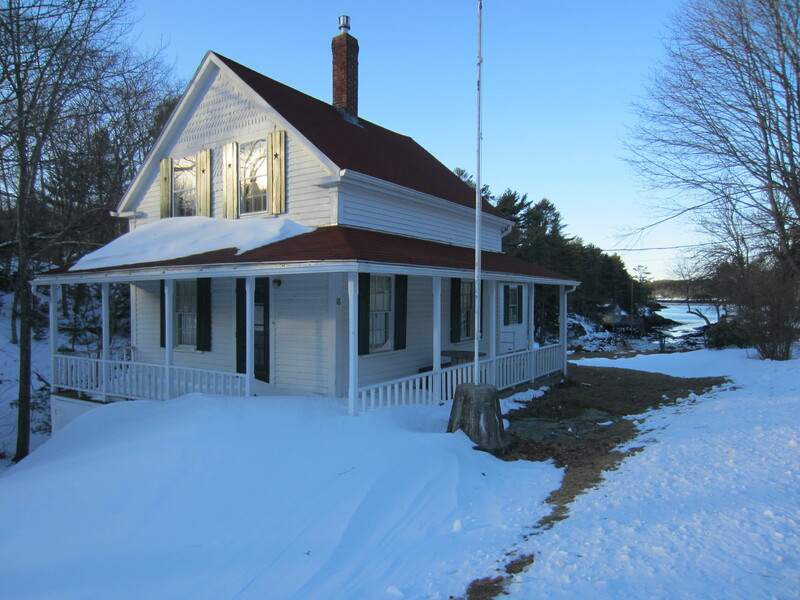 Robert dug out the car, and I took a spin around Old Schoolhouse Road with Boogie. We even rolled down the windows and enjoyed the brisk winter breeze. 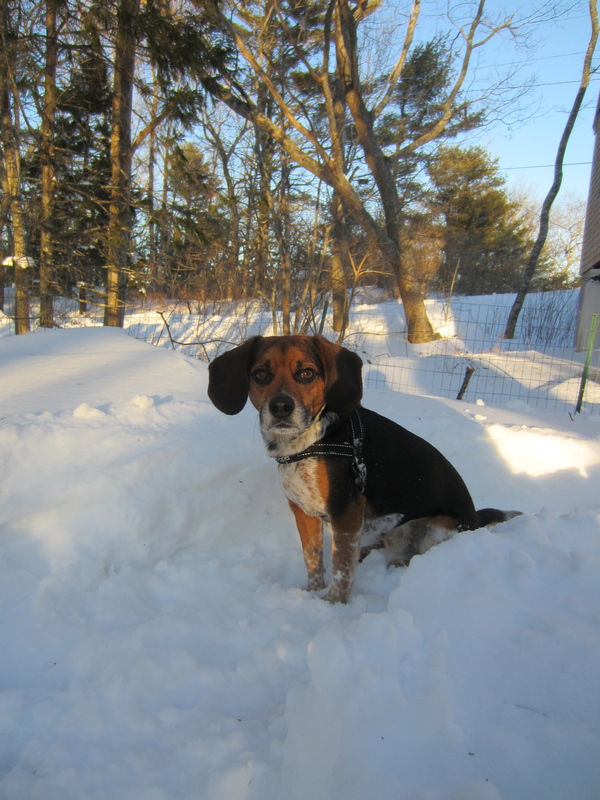 Here are a few shots from our walk down to the dock and a little play time with Boogie in his new snow race track around the back yard. 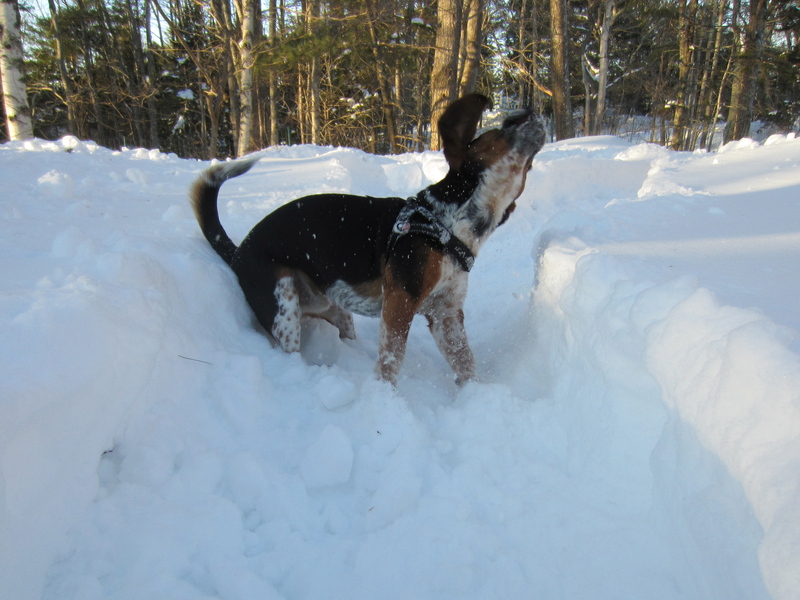 That dog loves snow. I include the shot below of our neighbor’s house. 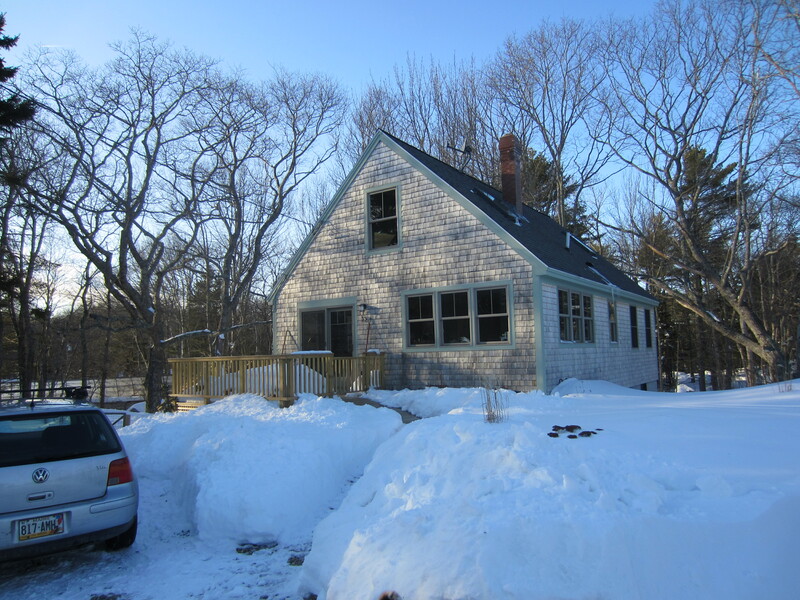 You’ll notice that the side yard is snow free. 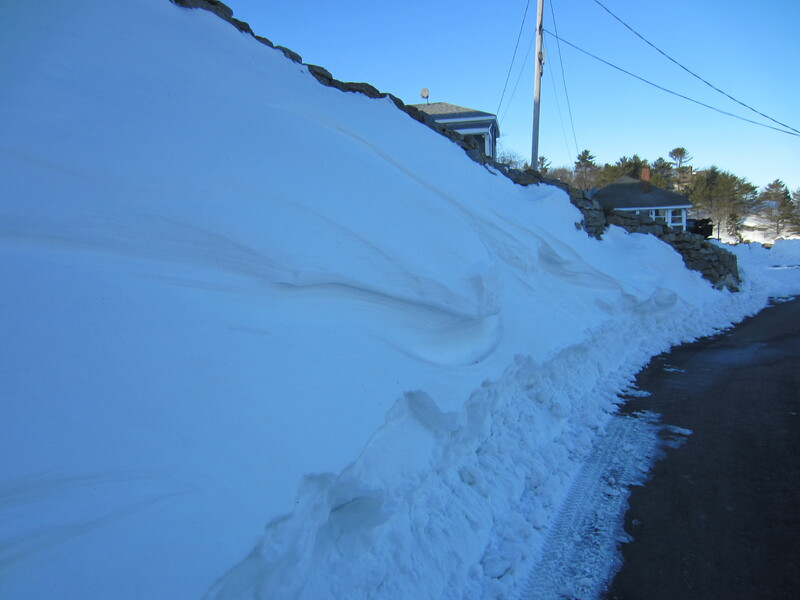 The wind blew in from the north throughout the storm and kept the head of Gott’s Cove clean of snow. 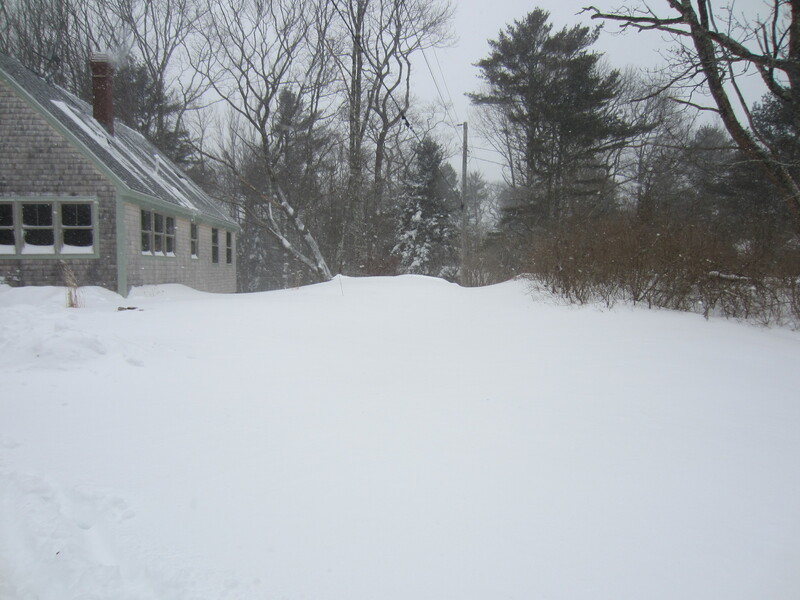 Well, we survived the historic blizzard of 2013, or Nemo as the Weather Channel has dubbed it. When did they start naming every storm? And what are the minimum requirements to get a name? 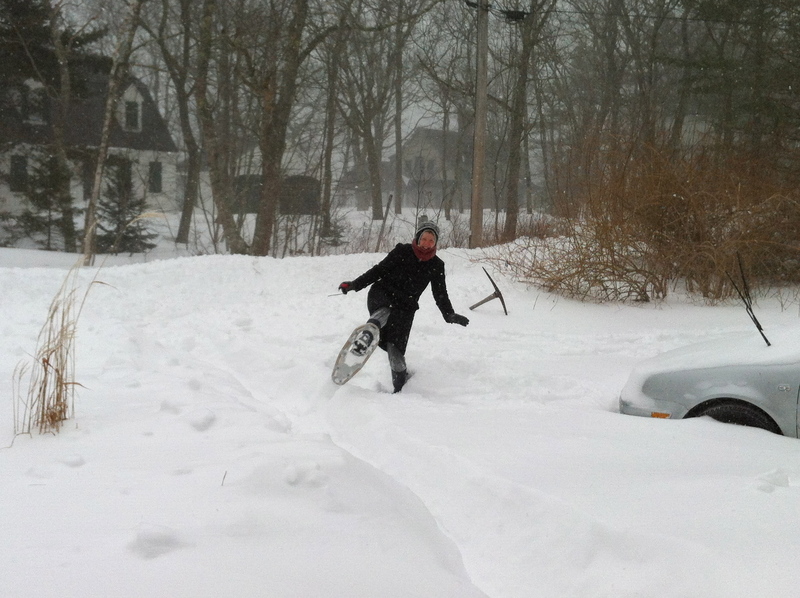 I’ve been posting pictures of our snowy adventures over at Facebook, but my friend Jim is committed to remaining free of Facebook, and I commend him for it. He has nudged me to get blogging, so here I am. 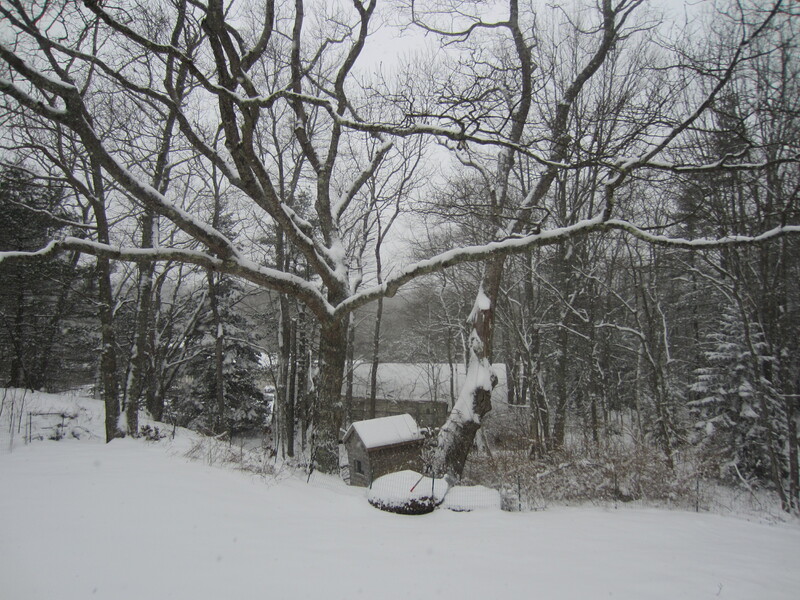 The snow started early on Friday morning. 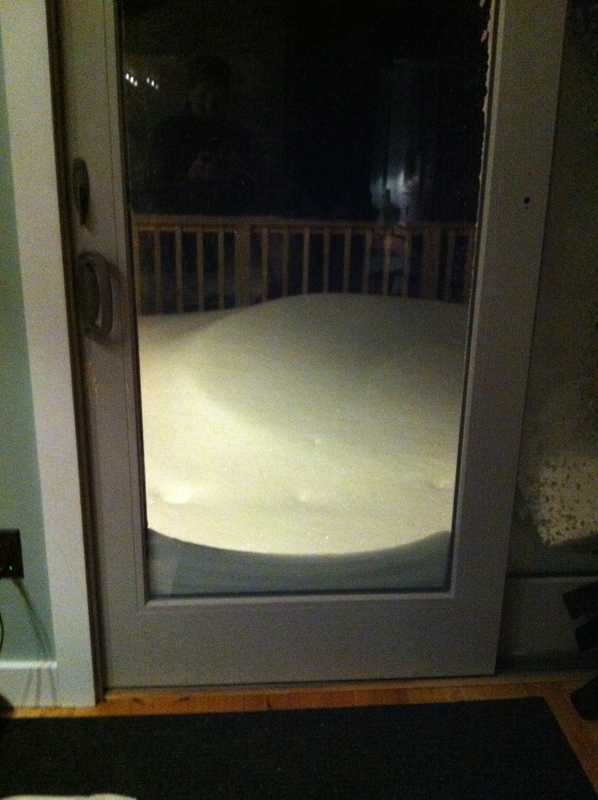 There was a dusting on the porch when I got up at 5:45 a.m. to let the dogs out. By about 9:30 a.m., we had several inches as you can see from this first shot of the house. 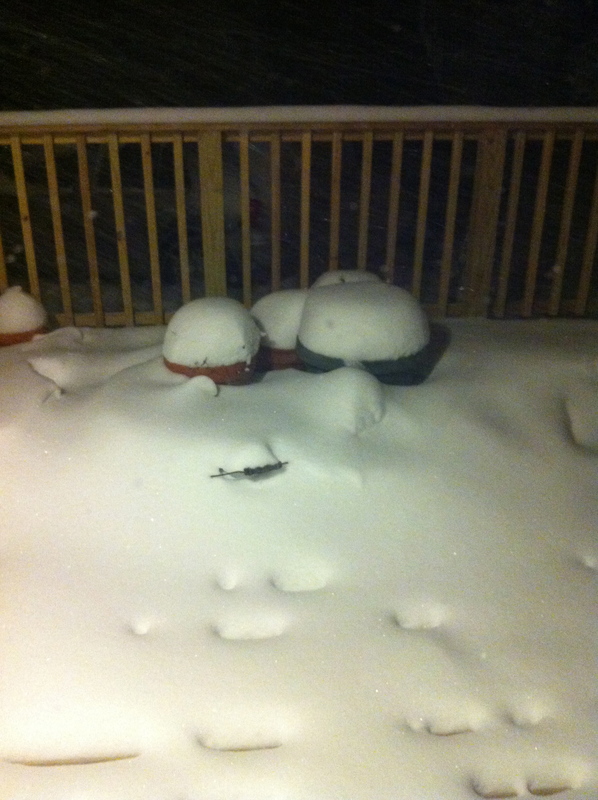 By about noon, there was at least a foot on the ground. 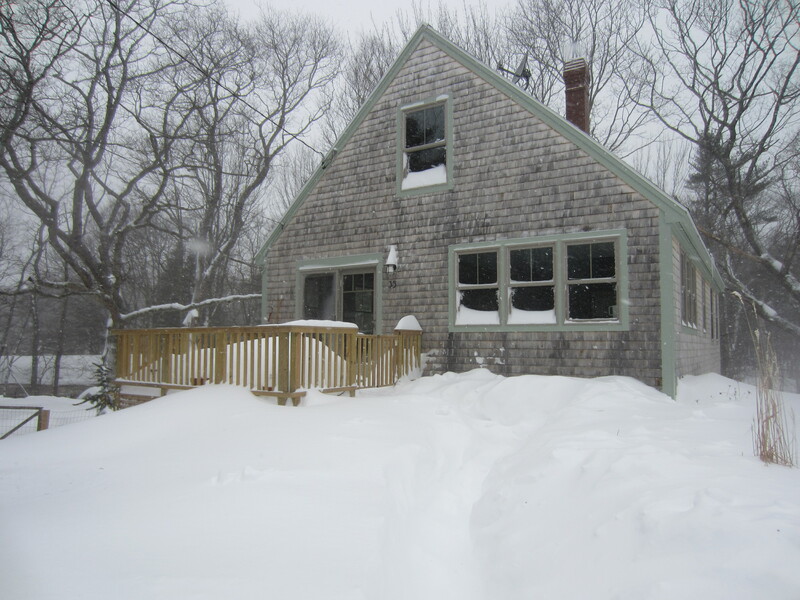 And this early snow on Friday was not even from Nemo, which was still moving up the coast. 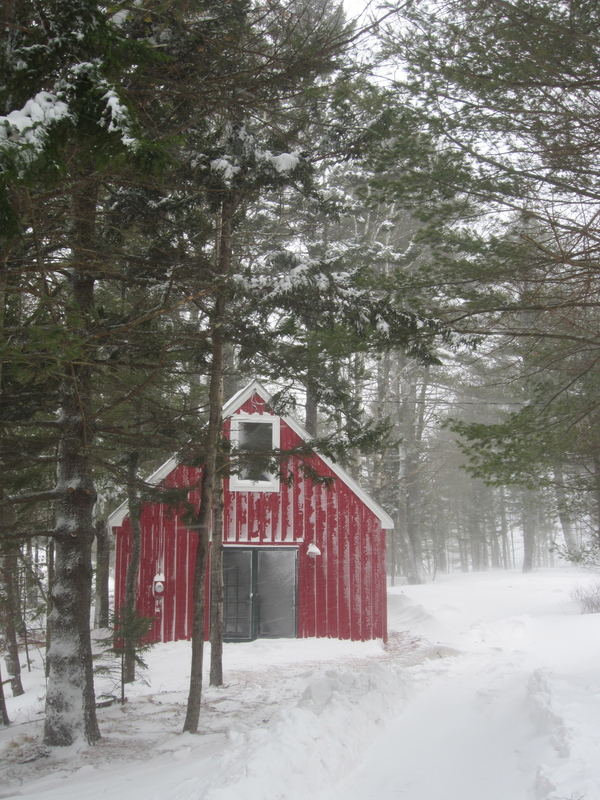 By late afternoon, the wind picked up and it started to snow sideways. 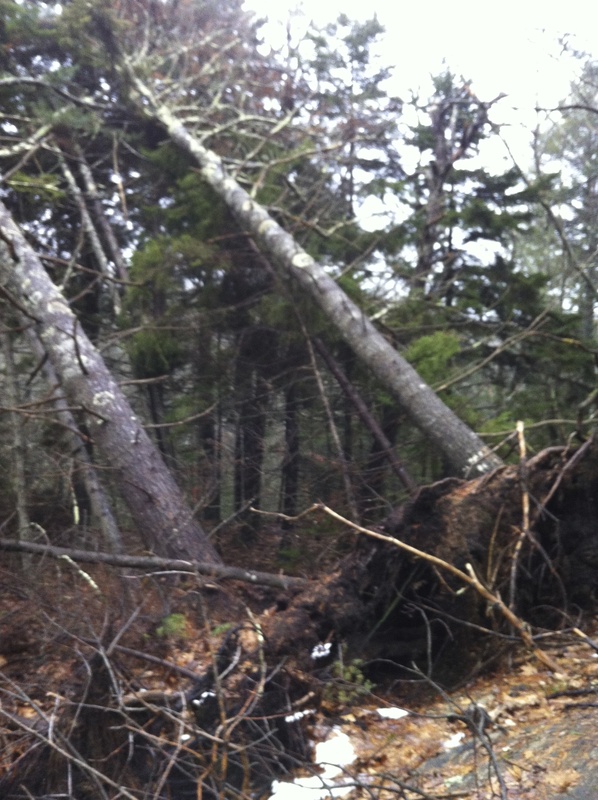 The worst of the storm came overnight. We were lucky not to lose power. 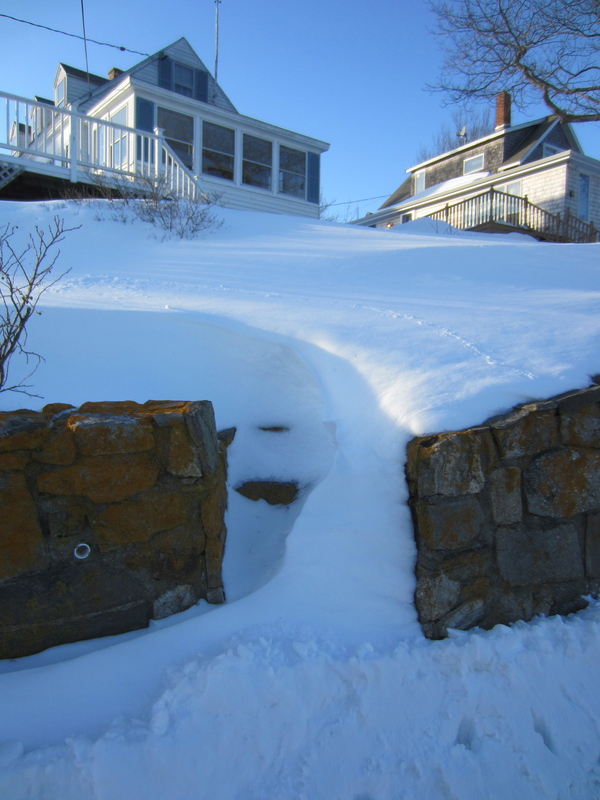 By morning, 2 feet of snow surrounded the house with much deeper drifts and the snow kept falling. Here’s the house on Saturday morning. 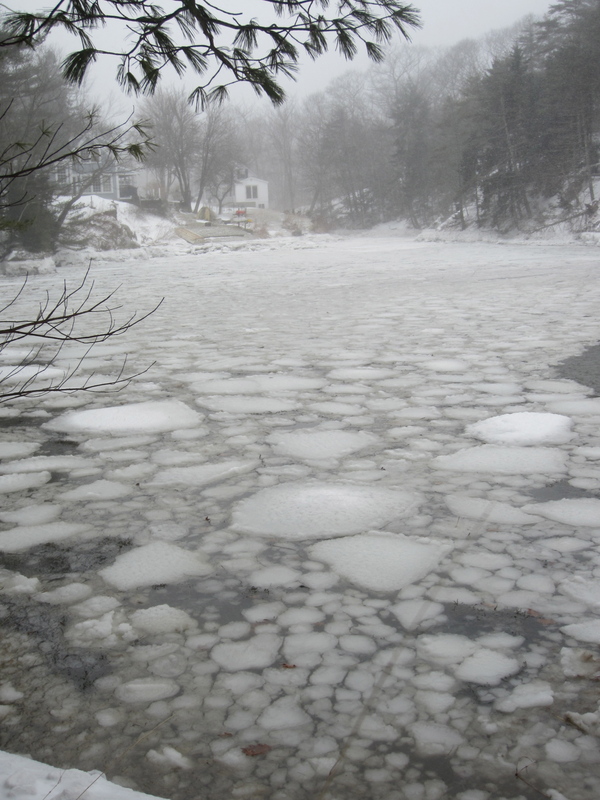 Here are some shots from Friday morning through Saturday morning. I don’t think I’ll see my frog until June. Below is the porch on Friday night at about 10 p.m.
Here’s the porch at 5:30 a.m. on Saturday. 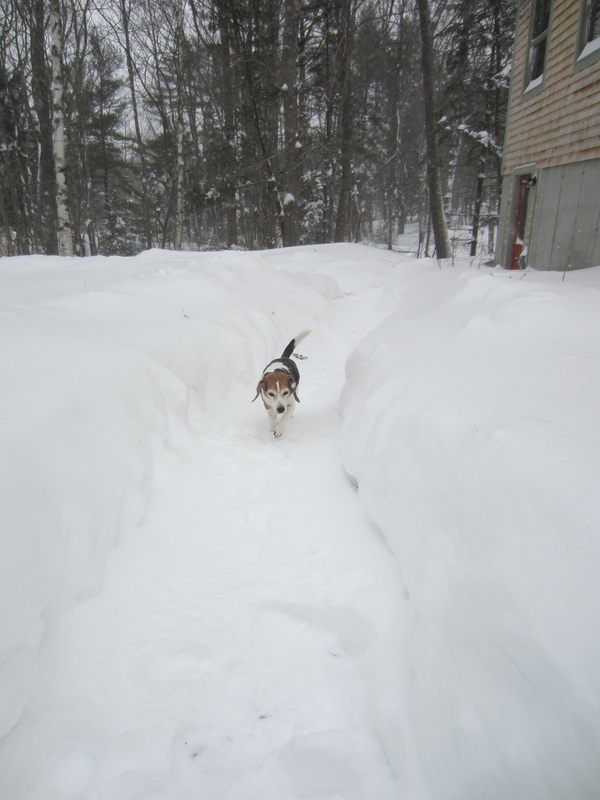 Robert actually got out there and shoveled a path for the dogs. That’s devotion. 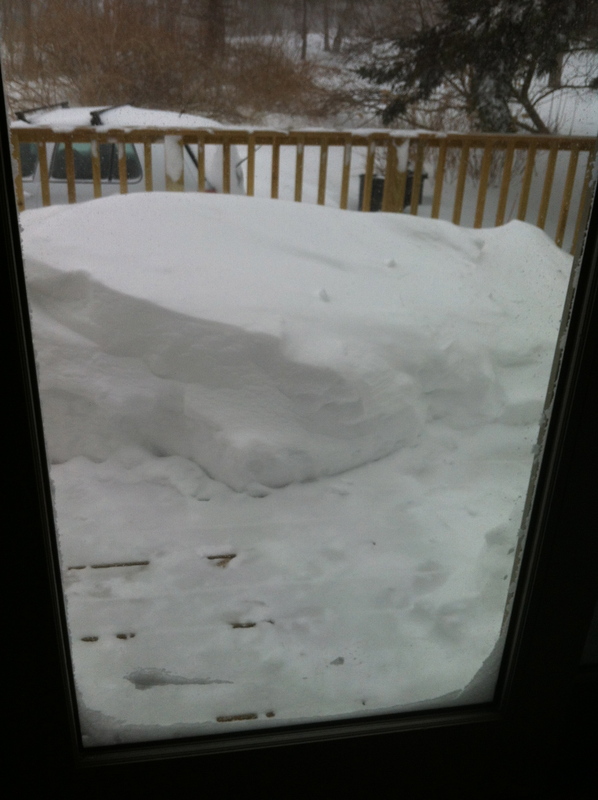 And here’s the porch by 10 a.m. on Saturday. I had a good time trying out my new snowshoes even though the snow was very fluffy and I really wasn’t walking on top of the snow. 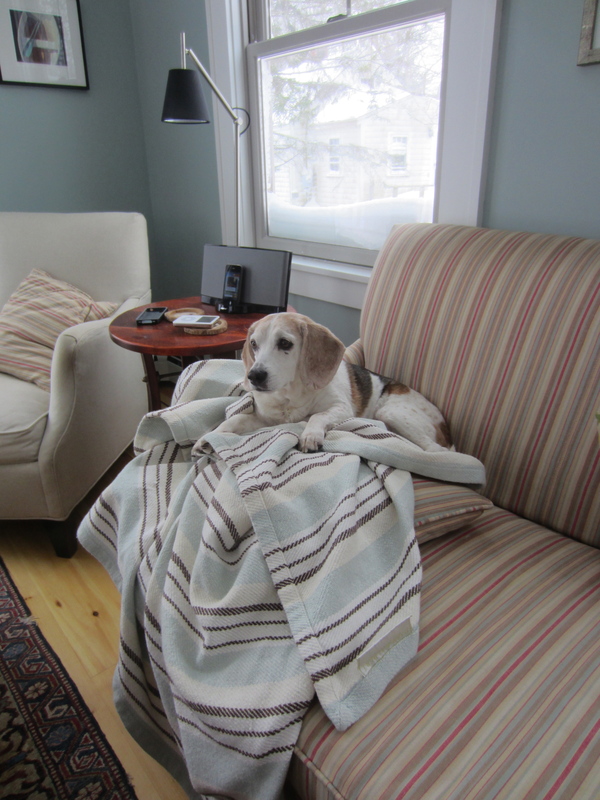 Wrigley decided to ride out the storm on the sofa. Actually, not a big change from how he rides out most days. 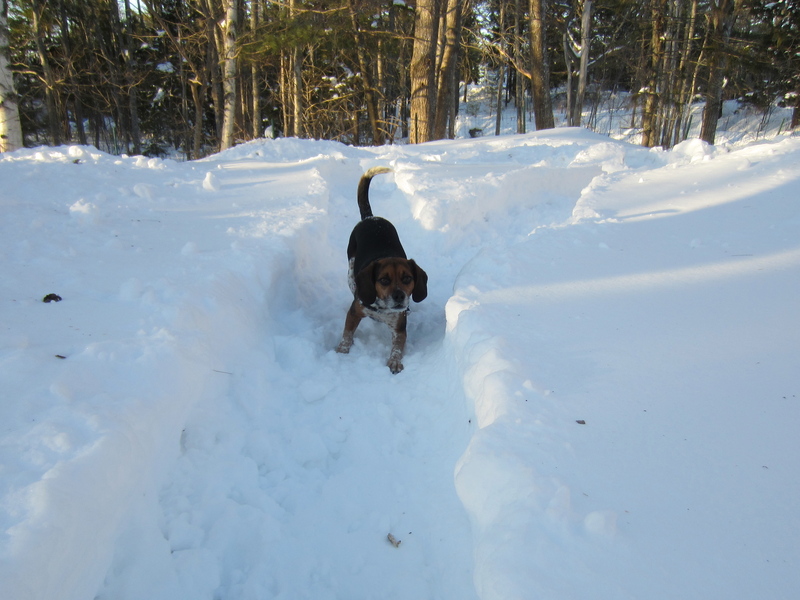 Rocket appreciates the new snow track that Robert shoveled around the back yard. 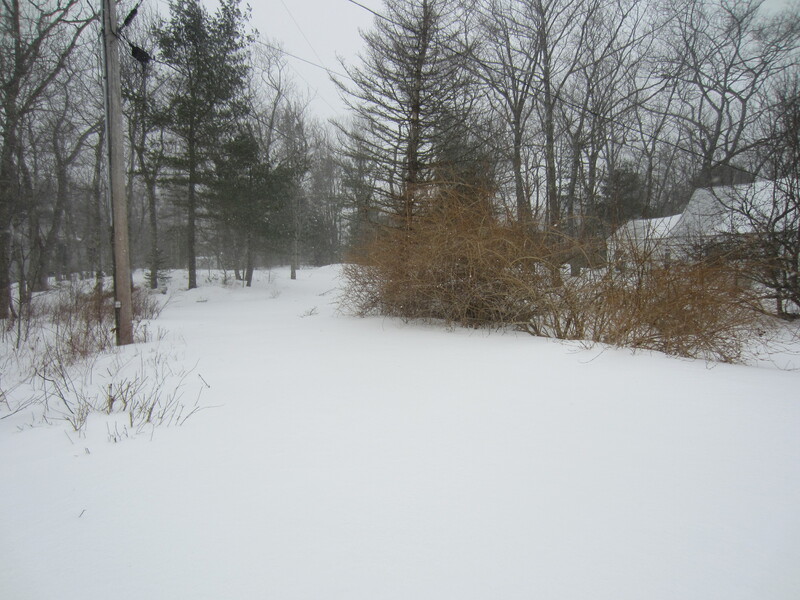 Lewis Road was snowed under as you can see from this shot looking up the road towards the Moore’s house. And looking down the road toward the Zimmerman’s house. 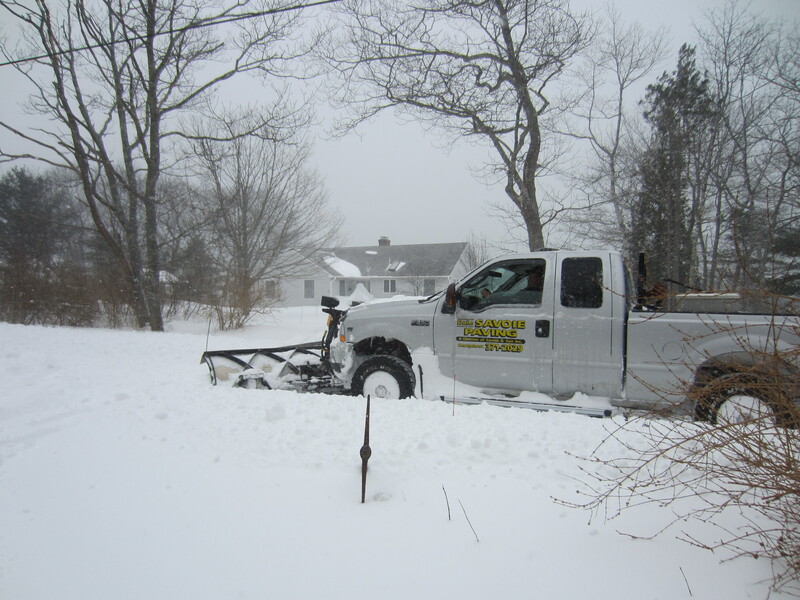 And then along came our trusty snowplow driver. They have done a great job keeping the roads clear. I took a walk down the road and got a few shots despite the wind and snow. 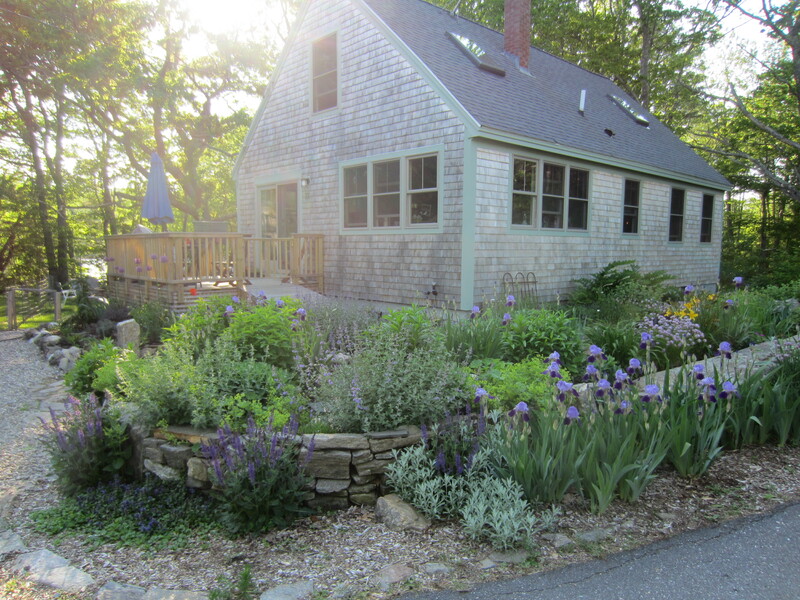 This is our neighbor Sue’s art studio. And the view of Gott’s Cove at high tide looking back toward the Start’s house. I haven’t gotten out with my camera today. But the sun is out and it’s absolutely gorgeous. I’ll try to post some shots tomorrow. Well, the weather is playing tricks on us. Last week, it was bitterly cold. I don’t think I’d ever experienced that kind of cold. This week, it’s in the 50s, damp and grey. Almost all the snow has melted and it’s muddy. I thought Boogie and I should get out there for a hike while it was so warm though. I’ve been wanting to explore the Josephine Newman Audubon Sanctuary for some time. Maybe 5 years ago, while we were on summer vacation in Five Islands with our good friends Alan and Kerry, we went to the sanctuary, parked, and set off down the trail. We got no more than 20 yards before we were attacked by the worst swarm of mosquitoes any of us had ever experienced. The fact we had all bathed in Deep Woods Off made absolutely no difference to those little flying vampires. We all ran for our lives, and I’ve never been back. So yesterday was the day for our triumphant return. No mosquitoes in January! There is a nice color-coded map of the trails on a sign near the parking area. Unfortunately, the paper maps that are very helpfully provided are not color-coded, thus requiring better map-reading skills than I apparently have. So we set off on the orange trail. Things were going beautifully. 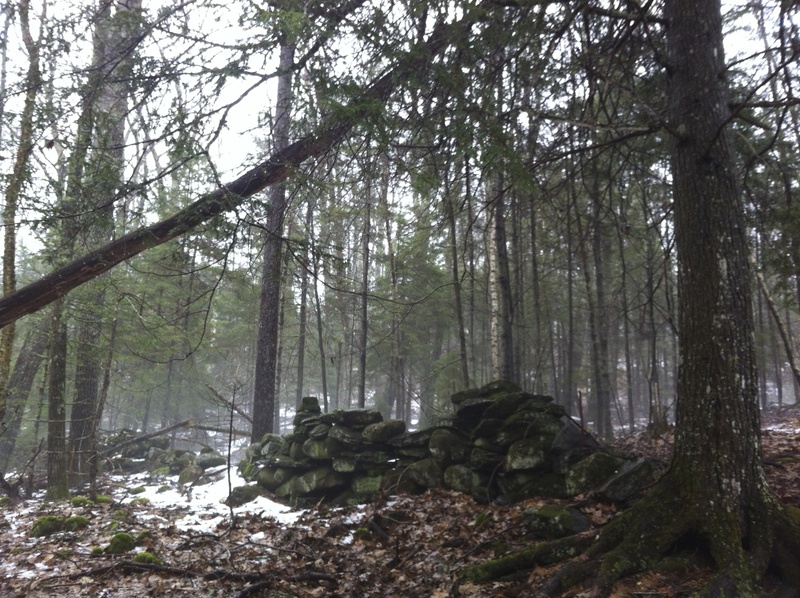 My iPhone pictures don’t capture how moody and mysterious it was in the woods with the mist and the fog. 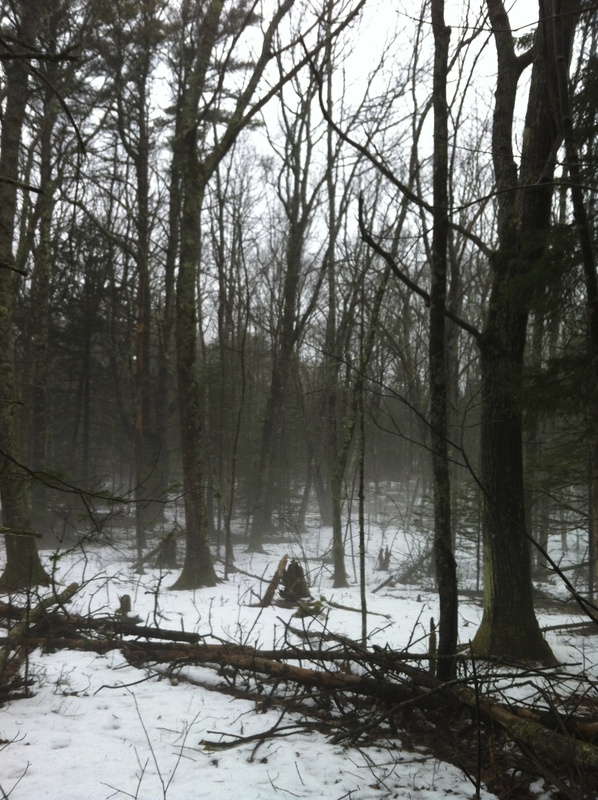 At one point, we caught sight of several deer running into the woods just ahead of us. Pretty soon, we came upon a trail with red blazes on the trees and took that one. I remembered red being one of the choices on the sign, and it seemed to correspond with the lines on the map. But then, I came to an intersection with a trail marked with blue blazes. I thought it was the trail on my map that would take me down to the edge of Robinhood Cove, so we headed off down the blue trail. I tried not to get worried when the trail just went on and on, but eventually we came upon a body of water that didn’t correspond with anything on my map. I kept going, assuming/hoping the trail would just lead back to the parking area since all of the trails on my paper map and the parking lot sign were circular. The blue blazes seemed new, and the trail was very well marked and defined. 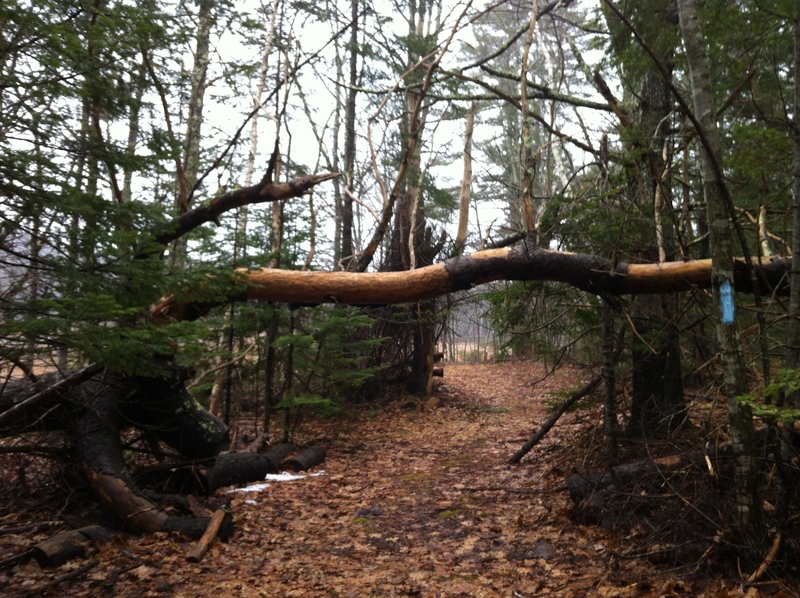 I felt like I wasn’t in the Newman Sanctuary anymore, and yet I was on a well-marked trail. It didn’t make any sense to me. I didn’t know of any other park in the area, so I called my friend Sarah who hikes a lot in Georgetown. I told her what was going on, and she said she thought I was just on the longest trail in the sanctuary and I should just keep going. Which I did. This went on for more than an hour, which doesn’t sound like long. But when you’re not sure where you are or where the end of the line is, it’s a little nervous making. Plus, it would start getting dark around 4:30 and at this point it was 3:30-ish. Finally, Boogie and I came down a steep hill to an intersection in the trail and there was a new sign posted on a tree right in front of us. We were in the Berry Woods Preserve. According to the map, I was more than a mile from the nearest trail in the Newman Sanctuary. I called Sarah back: “How the Hell did you get there? !” I was very close to a main road at this point, but several miles from my car and it would be dark before I could retrace my steps. Sarah was in Freeport, and Robert didn’t have a car in which to come get us. 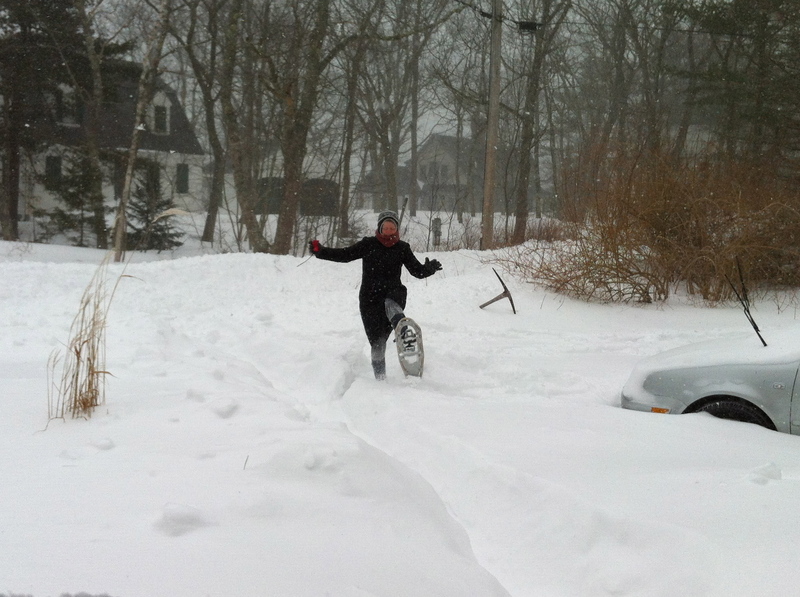 I called my friend Katy who, thankfully, was nearby and offered to hop in her truck and come rescue us. Thank you Katy!!! Aside from the wandering around lost, the hike was beautiful. There are several streams throughout the preserve and the Nature Conservancy has built nice boardwalks over them. 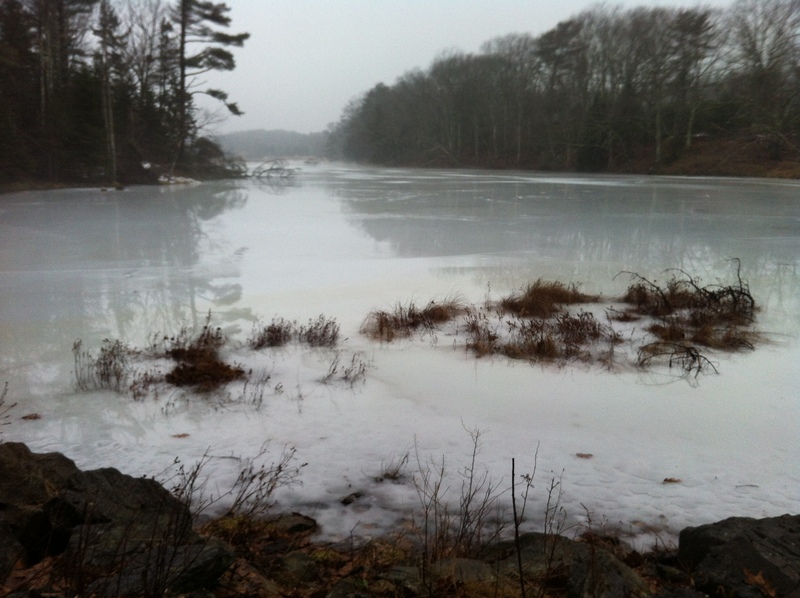 At the end of the trail, near Bay Point Road, you come out on an enormous pond, which is frozen right now. As I said, the trail is very well marked. My only suggestion: how about a sign at the point where you leave the Newman Sanctuary and enter the Berry Woods Preserve? As I write this, the fog is clearing and sun is emerging. It’s a very balmy 53 degrees outside. Perhaps Boogie and I should hit the trail again. This time, we’ll leave a trail of bread crumbs. Happy National Pie Day America! Well, how did your National Pie Day celebration go? I’m sure all of you reading this post celebrated this important holiday on Wednesday, January 23rd. I know what you’re thinking. What will the American Pie Council think of next? To persuade unwitting Americans to eat more pie, they’re on the morning shows telling us that pie extends life expectancy and improves performance in the bedroom. They’re on Capitol Hill pushing for another pie tax rollback. Everywhere we look, there they are. So I’ll apologize at the start for supporting their pie-centric (pie-ist?) agenda. But I’ve drunk the kool-aid my friends. So I decided to honor this day and display my red-blooded American bona fides. I know you might be expecting me to write about the apple or cherry pie I baked, maybe even a huckleberry pie. (Editor’s note: Hello?! Blueberry Pie? We’re in Maine already.) But since I am a savory kind of guy (editor’s note: swarthy is more like it), I decided to go with a savory pie, a fish pie to be exact. I have limited to non-existent baking skills, so I didn’t think a sweet pie would be a good choice for me. The fish pie was pretty simple and not fancy at all. 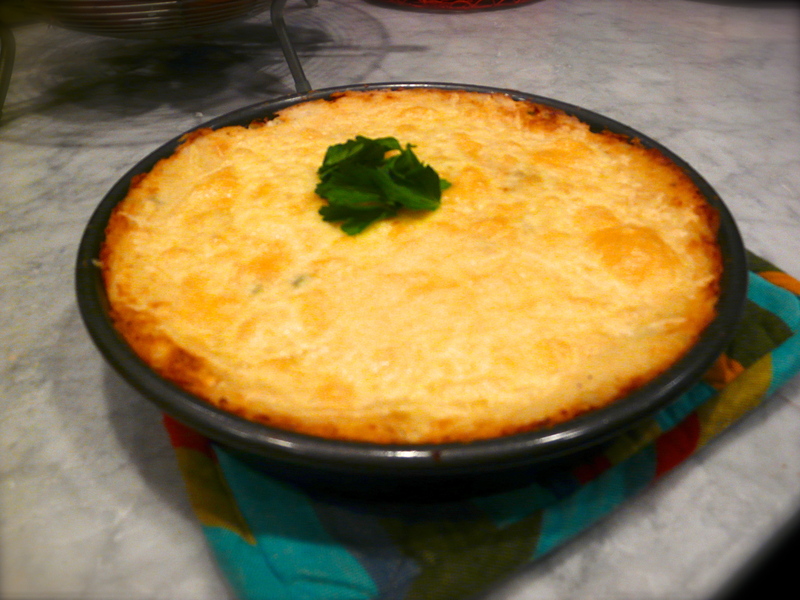 I took my inspiration from the British chef Jamie Oliver and made a traditional English-style fish pie. I happened to have about a pound of local pollock in the fridge and thought it would serve well as the basis for a pie. The ingredients list is fairly basic and can certainly be altered. I sauteed some onions, celery, carrots, and a hot pepper in olive oil along with a little garlic. Meanwhile, I boiled a couple of russet potatoes to mash for the topping. After the veg was tender, I placed it in the bottom of a 9″ cake pan along with chopped parsley and bite-sized pieces of the pollock. When the potatoes were tender, I drained and mashed them using my ricer and added a little milk and butter. I spread the mash over the top and popped the pan into a 400 degree oven for 30 minutes. After 30 minutes, I shredded some cheddar cheese over the top of the potatoes and cooked the pie for another 10 minutes. At that point the topping had browned some and the cheese was bubbling. Before we ate, we said the Pledge of Allegiance given that it was National Pie Day. We then switched into pie-eating mode and there was no holding us back. It was a great mix of fish, mashed taters, and veg. I hope your National Pie Day went as well as ours did. I look forward to reading your comments describing your festivities. One last note, Maine shrimp season started yesterday. It is a very exciting time of year. I will post soon about that. I see a white pizza covered in Maine shrimp coming out of my oven in the very near future. 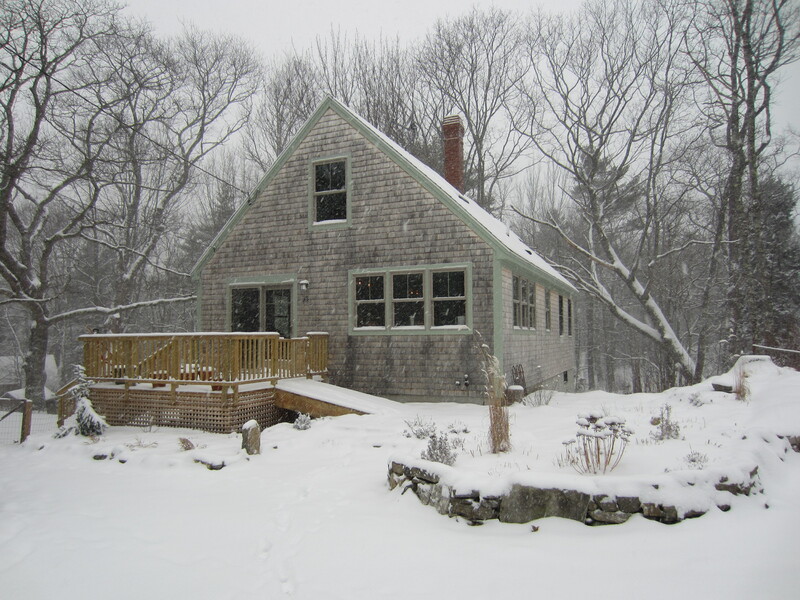 Well, it’s still winter here in Five Islands. Thankfully, the last couple of weeks have been pretty easy on us, until today. It was just 10° when I took the dogs for a walk this morning. But because the sun was out, it felt more like 12°, so not too bad. 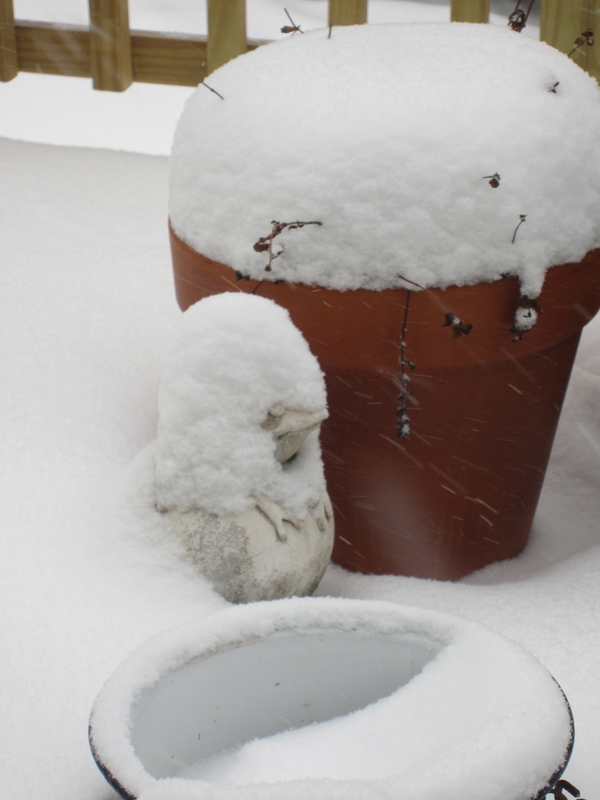 The December snow had almost completely melted before the first January snow came this week. I enjoyed the respite, and right now the streets are clear, making walking and driving no problem. While I like to complain about the winter, I am actually thrilled that this time of year brings us a new bounty from the sea. Next week, the short Maine shrimp season begins, and I am really looking forward to that. 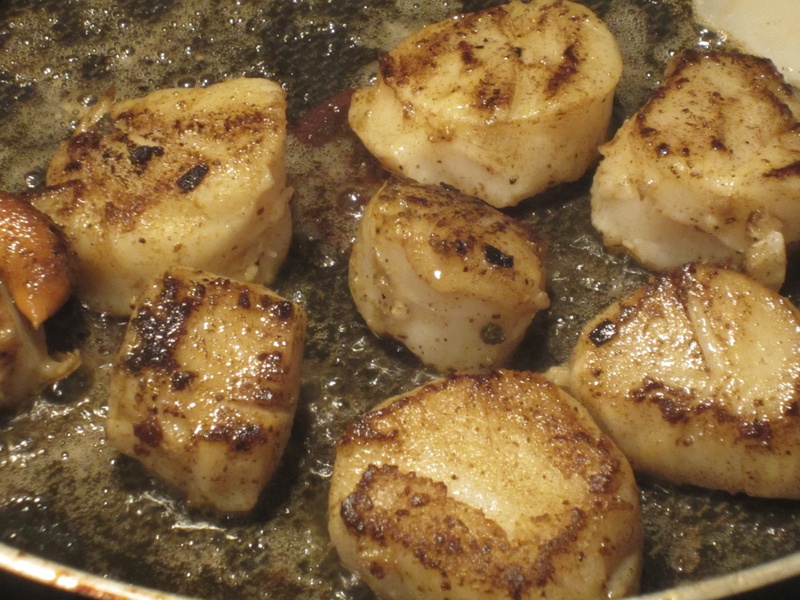 As I mentioned during the “week” of seven fishes, scallop season is under way. (And if you want to say it like the Mainers do, it rhymes with trollop.) Last night I finally scored my first batch of the freshest scallops you can imagine. Literally, I got them right off the boat! I’ve never had scallops this fresh before. 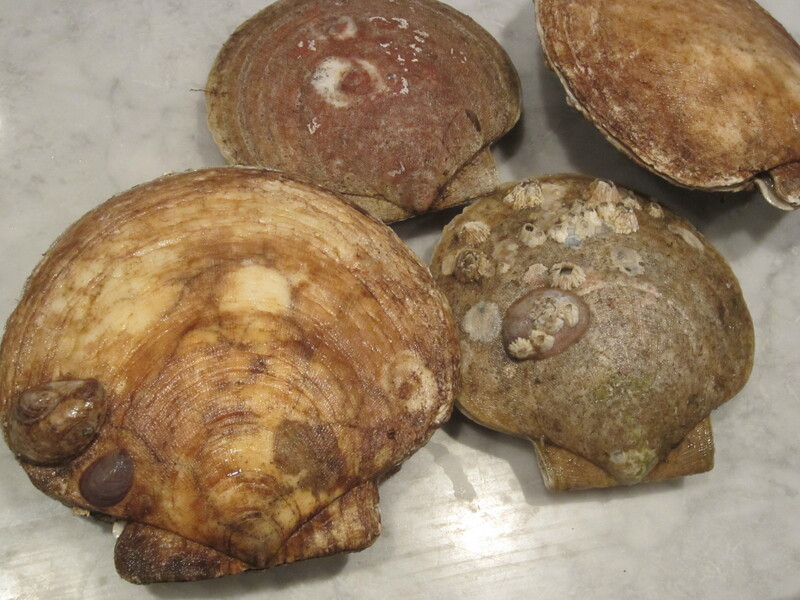 I asked the fisherman to give them to me in the shell because I am a big fan of scallop roe, and it’s almost impossible to find in US seafood markets. A few years back the fish market at Black Salt in DC did come through for me with scallops in the shell on a special order, so they get a star in my book. It was an entirely different experience getting the scallops so fresh and intact. These scallops were very much alive and not terribly interested in being the main attraction in our dinner. They opened their shells wide and then snapped them shut in self-defense. I can now say I have been bitten by a scallop. Thankfully since they do not have teeth, no injuries were recorded. Amy was freaked out a bit by the way they were moving on the counter and snapping their shells. It was pretty wild. 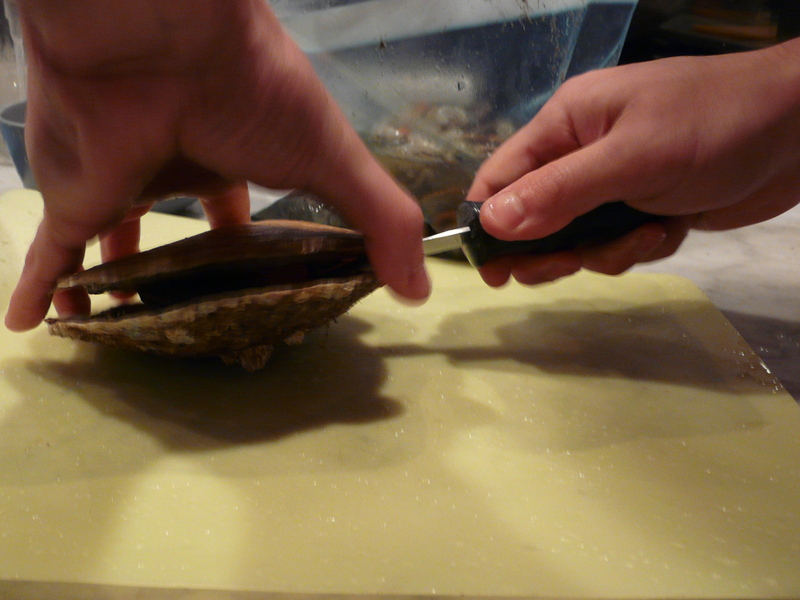 A fair amount of work goes into cleaning fresh scallops. 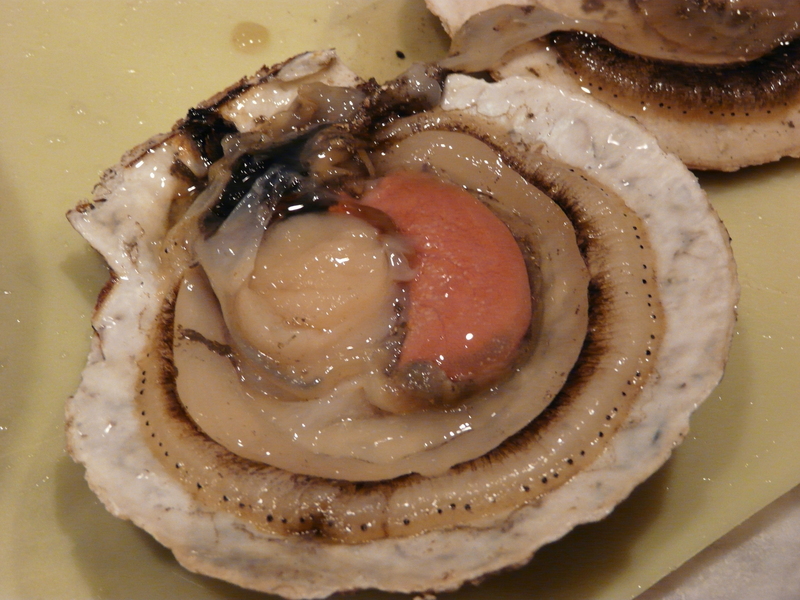 You must open the shell, remove the membrane, cut off the stomach and “catch” muscle, and then clean the adductor muscle and any roe, which are the parts you eat. But it’s worth it. 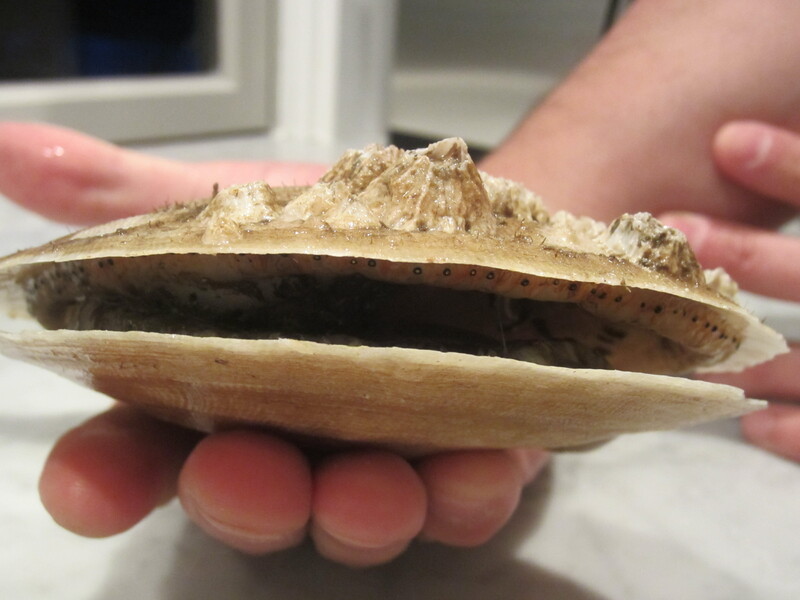 And since I call the “picker’s prerogative” whenever I cook, clean, and pick lobsters, I also get to call the “shucker’s prerogative” in scallop prep. It was great snacking on scallop sashimi right out of the shell. In addition to the scallops, the fishermen brought me a bag of scallop guts. I know, this sounds weird. But when I told them I was interested in scallops with roe in the shell, they figured I might want some of the extra roe that they normally just toss overboard along with a lot of guts attached. Very thoughtful of them. So I cleaned up the extras and ended up with a nice batch of about 30 scallop roe sacks. I’m a big eater, but this was too much for me, so I’m passing them along to a local chef who will put them to good use. 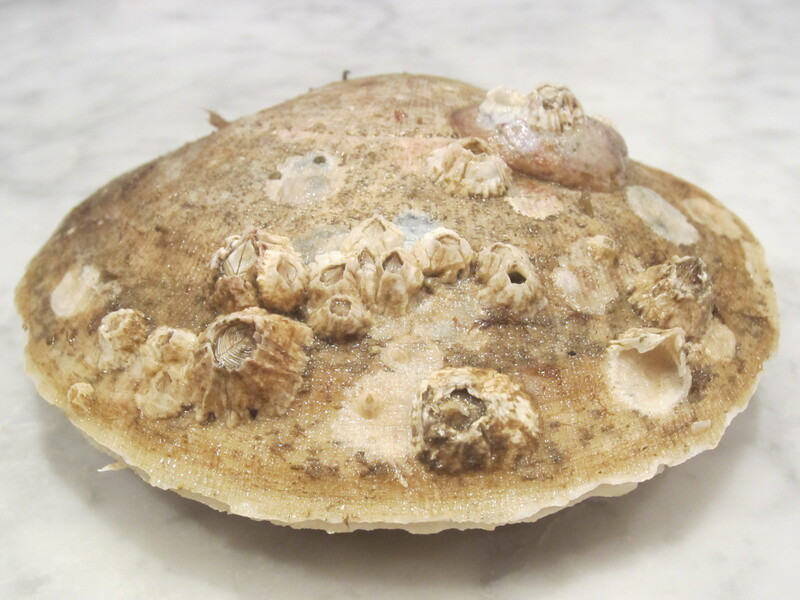 I’ll be very curious to hear how he incorporates fresh scallop roe into his menu this weekend. Amy and I were content with the roe that came with our scallops in the shell and a few extra for good measure. Given that we had such an abundance, I wanted to do a raw preparation as well as a cooked one. 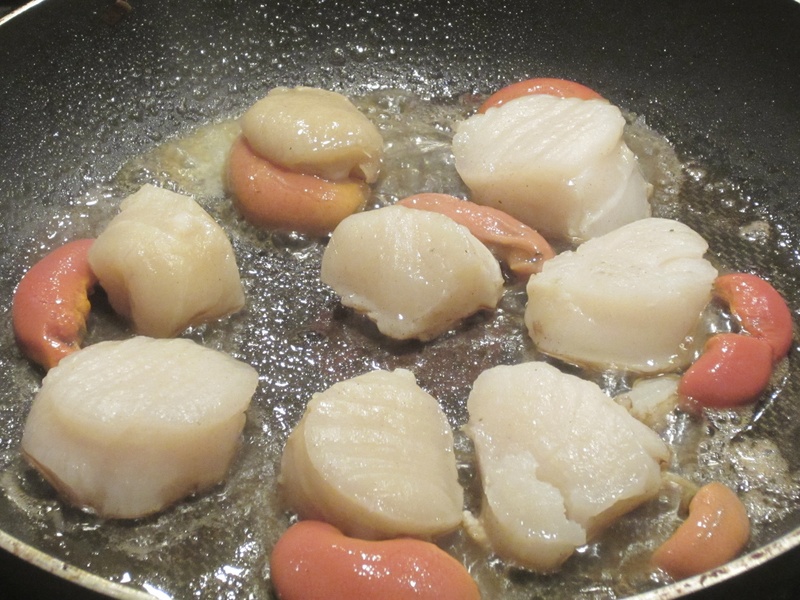 When you’ve got scallops this fresh, you have to eat some of them raw. 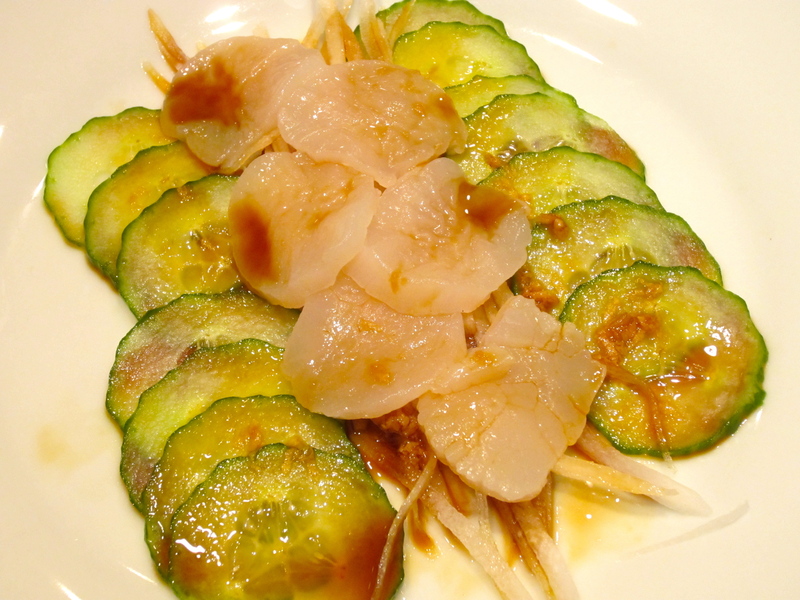 I had a daikon radish and a good English-style cucumber. My mandolin came in handy here. No, I didn’t bust out any crazy rhythms. I am talking about my mandolin slicer. This is a great kitchen tool that makes very thin slices and matchsticks of firm vegetables. I topped the cucumber slices and radish matchsticks with a soy-lime-ginger sauce and then thinly sliced (with a sharp knife, not the mandolin) my scallops. Oishi. For the main course, I sautéed cremini mushrooms, leeks, and garlic, and then added a bit of butter and half and half to make a sauce. I sautéed the scallops and roe in butter for a few minutes on each side. In restaurant-speak, the flavor profile of the roe is hard to define. It is definitely a different taste than the scallop itself. There is more bite to the roe than the scallop. And I think the taste is more subtle, but definitely a shot of the ocean. If you can, try it for yourself. That’s all for now. Next up, Maine shrimp season.